You can now apply filters to reduce clutter in the navigator panel of the code review tool. 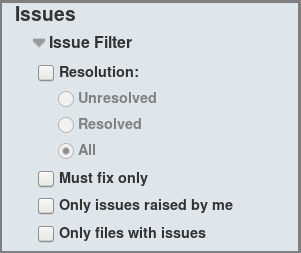 Filters are useful when change sets contain many files or issues. The following image shows the filter options. The default setting is to show everything. 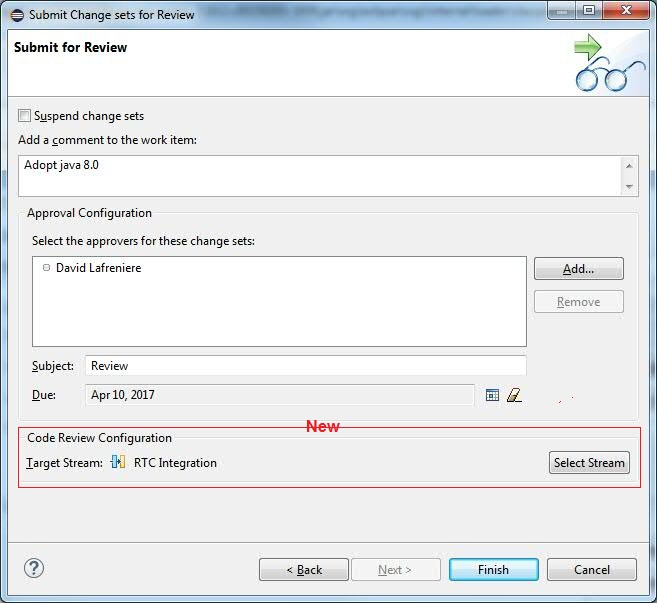 The Submit Change sets for Review action now sets the code review target stream based on the flow target of your workspace. The project area must be enabled for code review because the context is needed to provide the paths of the files under review. 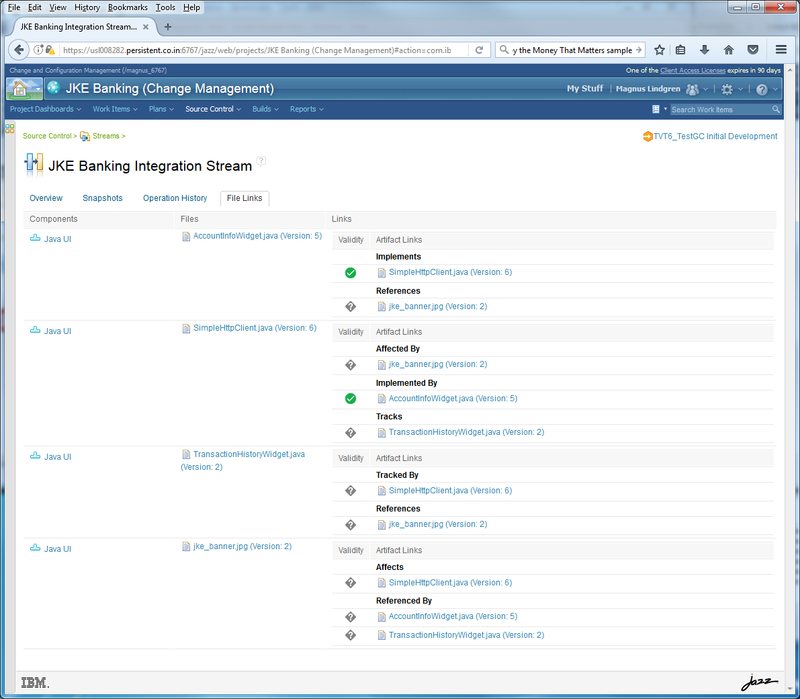 You can now find the links between SCM-controlled files and other artifacts for all files in a stream, snapshot, or baseline. 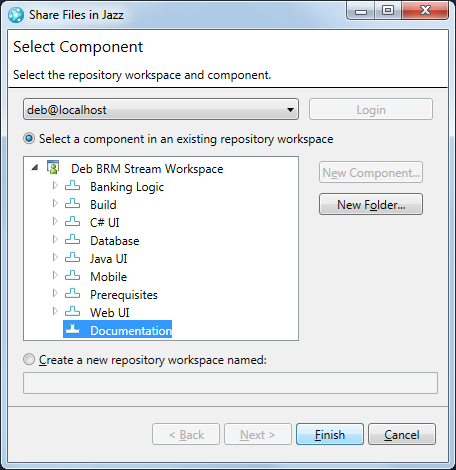 Each stream, snapshot, and baseline has a File Links tab, which displays the files within that object that have links associated with them. The display includes the validity of the links so that you can address any discrepancies. You can navigate the links and change the validity status from this view. The validity status can now show the history of links with a valid status between two artifacts. This feature enables you to discover when the relationship was considered valid when you decide whether the status of the link has changed. 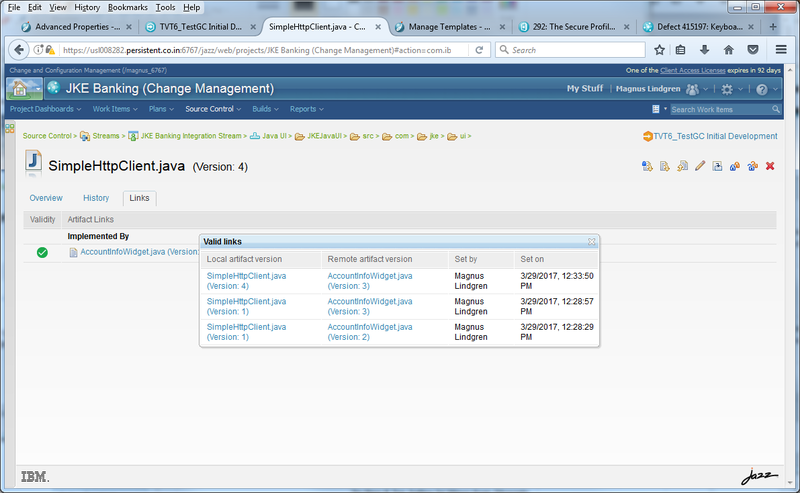 A new Restrict Change Set Size precondition is available that you can set on source control check-in operations. This precondition ensures that the number of changes in each change set does not exceed the value that you specify. For details about setting preconditions, see Setting preconditions and follow-up actions. In the Windows Shell and client for Microsoft Visual Studio IDE, users with the required permissions can unlock files that were locked by other users. Users see the message in the following image when they attempt to unlock a file that is locked by another user. You can now share files directly under the sandbox, or in any folder in the sandbox, from the Windows Shell client and the Sandbox Explorer view of the client for Microsoft Visual Studio IDE. Previously, you had to set the environment variable RTC_NET_ENABLE_SHARE_FILE to true to see this option. You no longer need to set that variable. 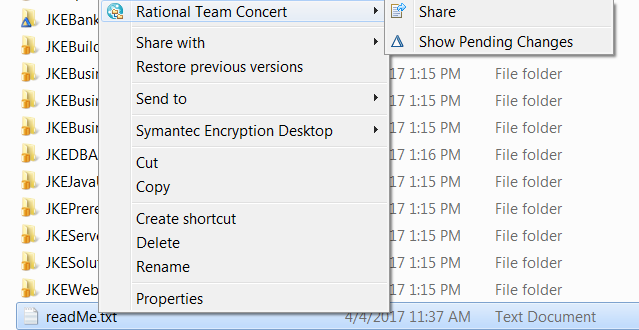 You can now install the Rational Team Concert integration into the Microsoft Visual Studio 2017 IDE. 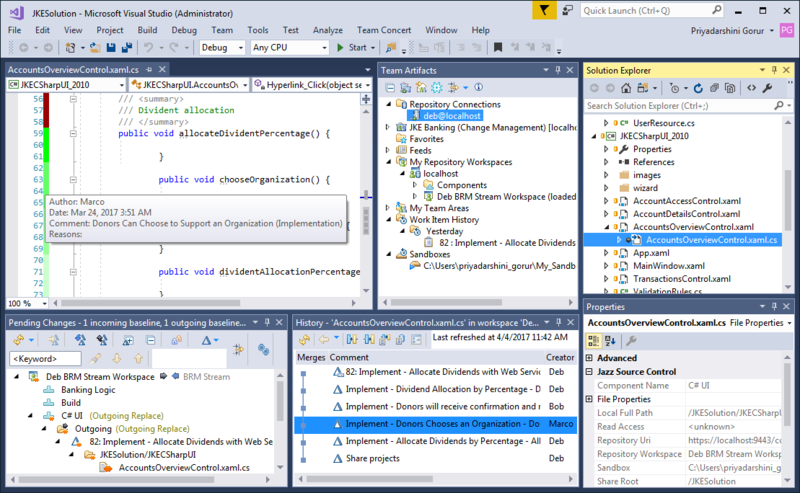 Unlike previous versions, Microsoft Visual Studio 2017 allows multiple instances of the IDE (such as Professional and Enterprise) to co-exist. IBM Installation Manager detects the instances of Microsoft Visual Studio 2017 on the system and lets you install the Rational Team Concert integration into all of them. The SAFe process describes Release Predictability as an aggregate of Team PI Performance (see http://www.scaledagileframework.com/metrics/#T3), which is a metric to describe achieved value over time. Achieved value is a calculation of Actual/Planned business value derived from the Team PI Objectives. However, stretch objectives should not be considered when summing the planned value. This milestone adds a Boolean attribute that distinguishes between stretch and committed PI Objectives. The Learning Milestone work item type was previously provided for Portfolio and Value Stream levels in the SAFe 4.0 Process (Portfolio) template, but it did not exist for the Program and Team level. Because the Learning Milestone work item type is part of the SAFe Spanning Palette, it is also an important artifact for Programs and Teams. The Learning Milestone work item type is now available for the Program and Team level in the SAFe 4.0 Process (Program) template. A Minimal Viable Product (MVP) Feature or Story is one with just enough features to gather validated learning and determine whether further investment is warranted. As part of establishing an iterative delivery plan, Epics are divided into Features and Stories, some of which might be MVP. This milestone adds the MVP attribute, a Boolean flag, to help you identify the Features and Stories that are MVP candidates. An MVP Capability is one with just enough features to gather validated learning and determine whether further investment is warranted. As part of establishing an iterative delivery plan, Epics are divided into Capabilities, some of which might be MVP. This milestone adds the MVP attribute, a Boolean flag, to help you identify the Capabilities that are MVP candidates. 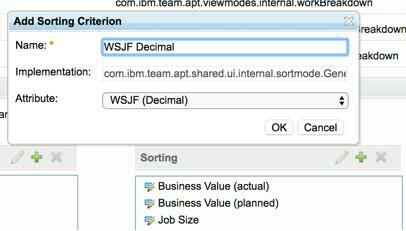 The WSJF and WSJF (decimal) attributes are now read-only in a Plan view. The plan editor now supports the use of a decimal attribute as a sorter, which lets you use the WSJF (decimal) attribute to differentiate between features that have the same WSJF integer values. 1. Create a project area based on the SAFe 4.0 Process (Program) template. 2. Navigate to the project area administration page, and then select Planning > General > Attribute Mapping. Add WSJF (Decimal) as a planning attribute. Click Save. 3. In Planning > Plan Types and Plan Views > Plan View Elements > Sorting, click Add. 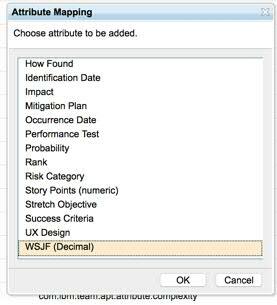 Select the WSJF (Decimal) attribute, enter a label, such as WSJF Decimal, and click OK. Save the changes. 4. Open a plan and edit the plan view to say Roadmap view. 5. Pick the WSJF (Decimal) attribute for sorting. 6. In the Column Display option, add the newly added WSJF(Decimal) attribute. Click OK. The work items are now sorted using the decimal attribute. 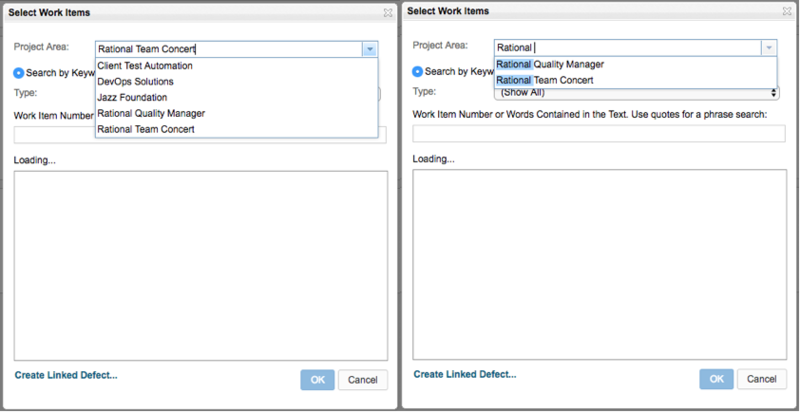 In the Add Link and Select Work Item windows, you can now filter project areas by keywords, which can help you find projects faster. 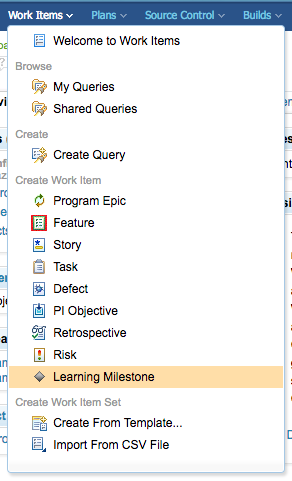 The label of the first column in a Taskboard plan view is now configurable. The default value for the label is Plan Items, but you can change it. In a plan view, you can now update the values of custom iteration attributes. You can also browse for more options when you update the Planned For column in the plan view.